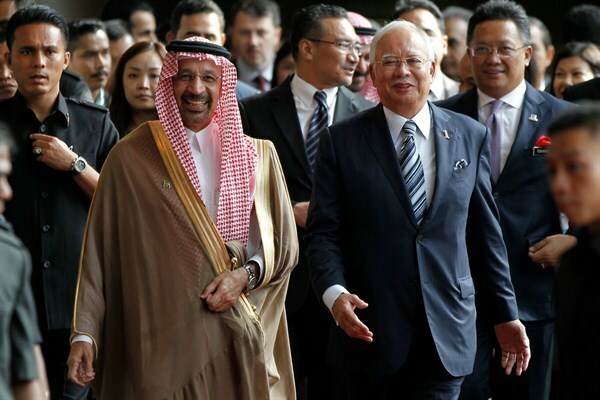 Saudi Energy Minister Khalid Al-Falih walks with Malaysian Prime Minister Najib Razak during the Asia Oil and Gas Conference, Kuala Lumpur, Malaysia, May 8, 2017 (AP photo by Daniel Chan). Oil markets are expecting the Organization of the Petroleum Exporting Countries (OPEC) and its allies to extend their supply quotas when they meet in Vienna on Thursday. The current production cuts have failed to drain bloated oil inventories due to a remarkable resurgence in U.S. shale production. Keeping production down will not be easy for the coalition of 24 oil producers, 11 of which are not in OPEC. Even if fully implemented, an extension of the deal will likely just prevent oil prices from falling, while giving more market share to U.S. shale.